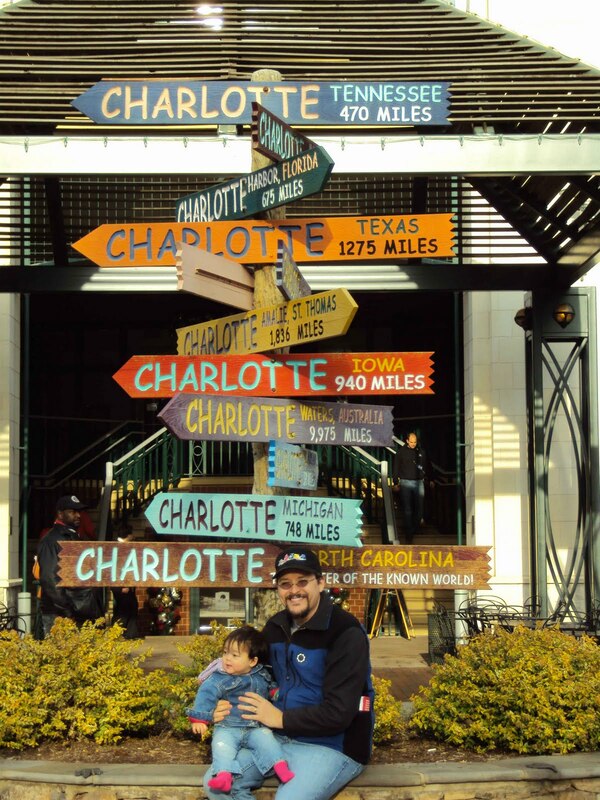 This afternoon, we took a trip downtown Charlotte- which the locals call Uptown- and took a walk around. Christmas decorations were still up and the weather was brisk. There were a lot of people roaming the streets in anticipation for the rise of the Queen City crown (NYC Times Square drops a ball, Charlotte raises a crown). We won't be watching the ball drop and we will *hopefully* be sleeping by the time the New Year arrives. We did celebrate by having a lovely steak dinner, thanks to the Omaha Steaks Christmas present from Grandma and Pop-Pop Tinkey. HAPPY NEW YEAR!! Like the beautiful tapestries that surely adorned the palace walls described within the book, Lady in Waiting is a richly detailed and beautifully woven story of modern day Jane Lindsey who discovers an antique ring within the binding of an old, dusty prayer book. The ring dates back to pre-Elizabethan era and belonged to the ill-fated Tudor monarch, Jane Grey. The book flips between the life stories of the two Janes. Jane Lindsey, antique store owner struggling with a crumbling 22-year marriage to Brad and her need to find validation from everybody in her life. Jane Grey, nobility and monarch for nine short days amongst the dark-seeded turmoil of English imperial unrest. Throughout the novel, each heroine struggles with life themes such as love, love lost, faith, fate. Through the interaction of each Jane and various secondary characters, each leading lady discovers that they are truly the main character in their own lives and that they are presented daily with the task to choose life, to choose love, to choose convictions and principles. Categorized as historical Christian fiction, Lady in Waiting is anything but the stereotypical staid Christian fiction riddled with outdated and preposterous heroines clinging to archaic values, morals and daily practices. In the style of Anne Tyler, Lady in Waiting is captivating and engaging. Seamlessly written and flowing between the two stories, this novel is a worthy addition to any library. 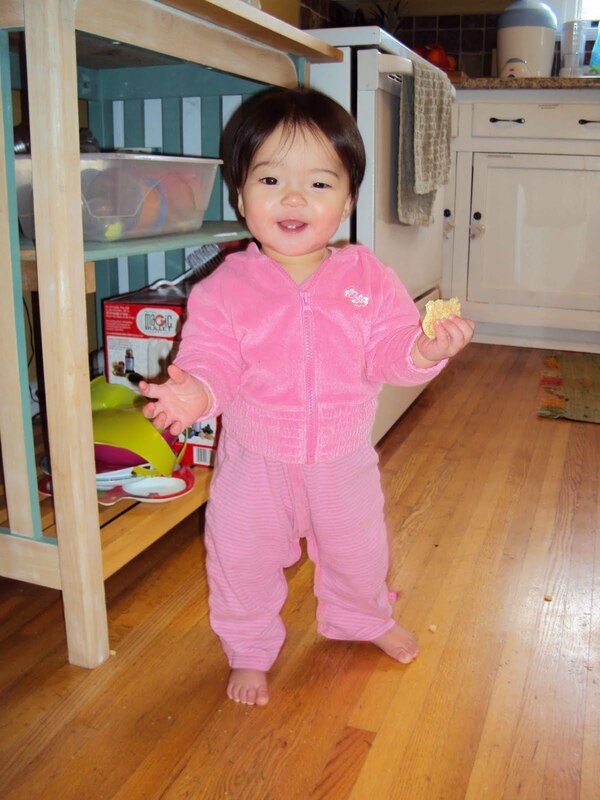 Cookie motivation- Katy is standing all by herself! So Big! "Are all of these presents for me?!" 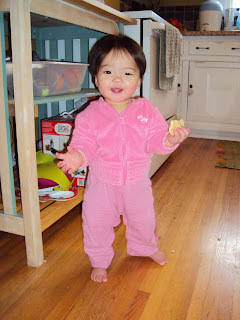 Today you are 45 weeks old, Katy! Your first birthday will be upon us before we know it! I've actually already gone out and bought some decorations for your Cookie Monster themed first birthday. 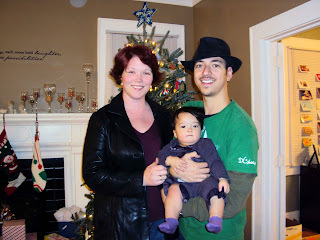 This past week was all about Christmas, family, good food and presents. 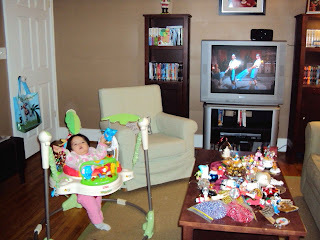 We attended the Northland Christmas Eve service via Internet last Thursday, December 23, 2010. Grandma and Pop-Pop Tinkey were in attendance in Orlando and we were able to see them when they panned the crowd. 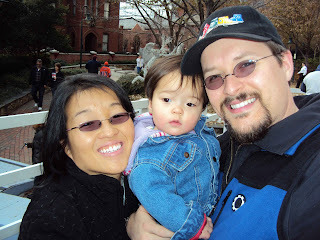 They even announced to the congregation that we were joining them via Internet from Concord! It was neat to be able to "attend" church with family. 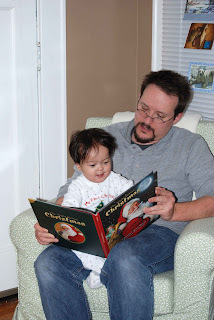 Nana and Grandpa Jones were here late Thursday evening but didn't get to play with you, Katy, until Christmas Eve Day. Uncle Rob and Aunt Julie also came on Christmas Eve Day. Christmas Eve Day and Christmas Day were spent at home, relaxing, enjoying each others company, eating good food and opening presents (separate blog post). 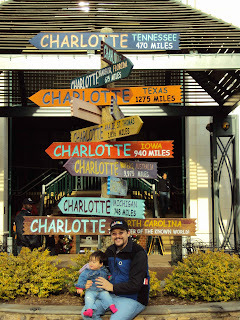 On December 26, 2010, we piled into the car and went to the Charlotte Motor Speedway to see the Carolina Christmas light show. There were all sorts of lights set up and various vendors and Christmas trees to see. The night was quite nippy, so the Living Nativity was not going on. You were very good for the outing, Katy. With the help of your singing, walking Dino from Santa, you've been getting around more. You walk behind Dino, Katy, and move from room to room with ease. You do tend to veer to the right, but you have managed to get up on your own, steer and back up. You are much, must steadier on your flat little feet. You will take a couple of steps if you are holding onto something or somebody. 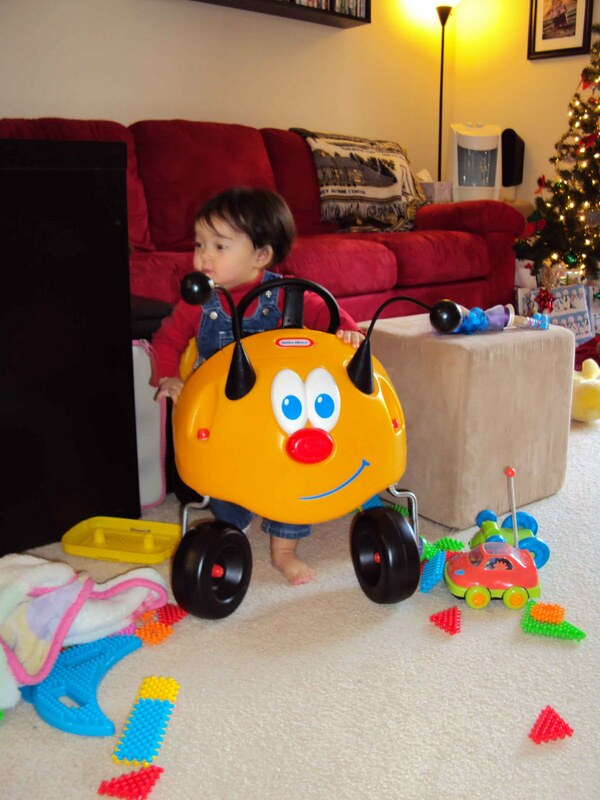 We have yet to see you walk on your own, though there were several "almost" instances this past week. You slept in your crib more, this week- sleeping for parts of nights and for several naps in your crib. This is a major accomplishment as you've been very bad about this for the past two months and Daddy and I have been lax in enforcing it. Rather, we've just been exhausted. With the onset of a new cold- thanks to some shared germs at Christmastime- our crib sleeping victory is temporarily short-lived. We are not giving up, though- let's just call it a temporary derailment- to be continued at a later date. 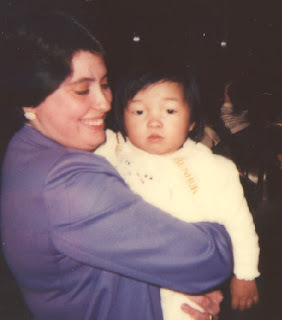 As many of the readers to this blog may know, I was adopted from South Korea when I was two and a half years old. 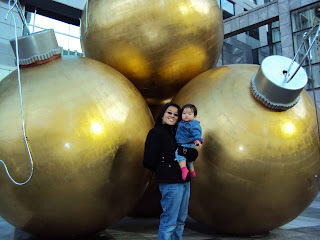 At the time, I was told that I was the size of an average American one year old at 22 lbs. So, I thought it would be fun to take a picture of you, Katy, in the outfit that I wore on the plane, on the way over from South Korea. 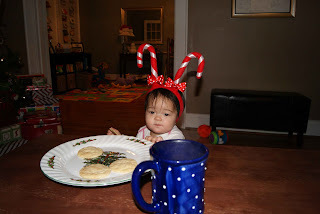 Of course, you are wearing it a year and a half early, thanks to good nutrition! After the toy fest that was Christmas 2010, you would think that you had PLENTY to keep you busy, Katy. You probably quadrupled your toy inventory with all of your toys, stuffed animals and books from friends and family. However, it seems that you still like to bang on the pots and pans, play in the Tupperware and get into Daddy's remotes for the T.V. Silly Girl! This is the 400th Blog Post on All Things Katy! In honor of such a milestone, I thought it'd be fun to record some other (Christmas) numbers here (in no particular order). -We peeled five pounds of potatoes for Potato Stuffing. -We had a 12 lb. turkey that took over four hours to cook. -Our Christmas tree was 8' tall. -You received six Baby's First Christmas Ornaments, this year. 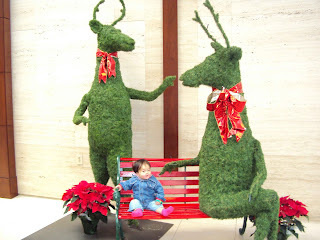 -Santa brought you three gifts- something you need, something you want and something for your future. -You received five stuffed animals as gifts. 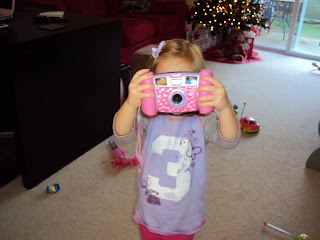 -We took 347 pictures of just Christmas morning! This number does not include the pictures that Uncle Rob and Aunt Julie took, nor the pictured Nana and Grandpa Jones took with their cameras. 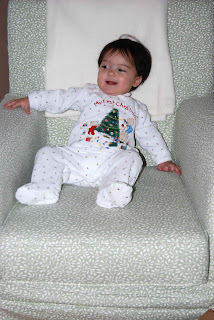 -You get to open one gift every Christmas Eve- a pair of new pajamas. -We had four guest- Nana and Grandpa Jones and Uncle Rob and Aunt Julie- for Christmas weekend. -Katy, you had so many gifts to open that it took three "sessions" to get it all opened throughout Christmas day. 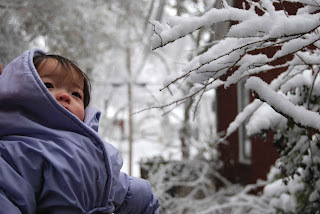 -We received a snowfall of two-three inches on Christmas day. -We mailed out 124 Christmas cards. There is so much to see and do on Christmas day! Poor Katy was tuckered out by the end of the night. 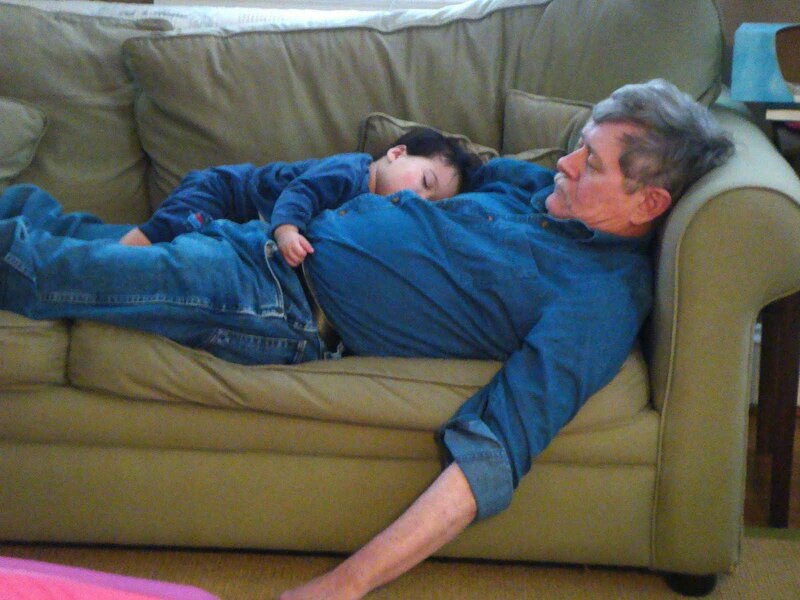 Uncle Rob made a comfy resting spot for a short power nap. 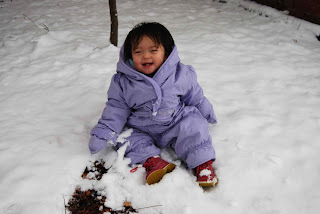 We had a White Christmas, this year! Of course we had to bundle you up and take you out in the snow. I'm sure it took us longer to get you ready, than it did for us to actually "play" in the snow. Happy Christmas, Katy! 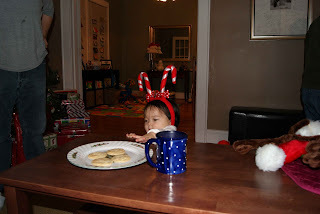 Today, we celebrated your very first Christmas! Nana and Grandpa Jones, Uncle Rob and Aunt Julie were all here to help us celebrate Christmas and I must admit, you were the star of the show! 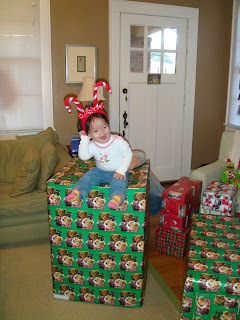 We woke up around eight fifteen AM and went downstairs where we were greeted by lots of "Merry Christmases!" Uncle Rob and Aunt Julie joined us shortly after we got downstairs and the present-fest began. 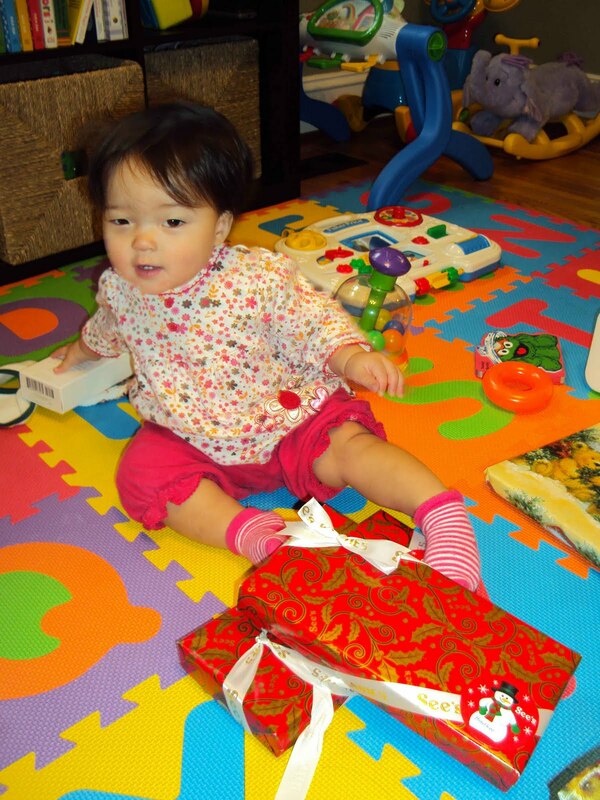 You began by opening your gifts from Santa. In the Jones household, Santa brings three gifts, just like the Three Wise men brought three gifts to Baby Jesus. Santa brings something you want, something you need and something for your future. This year, Santa brought you a singing, walking dinosaur (want), a big box of diapers (need), and a contribution to your 529 plan (future). 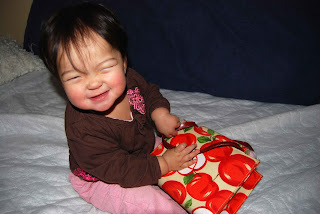 There were so many gifts to open from friends and family that you would open some gifts, others would open their gifts while you played and roamed around, then you would open some more gifts and the pattern went on from there. I don't think you officially finished opening gifts until dinnertime. Katy, you weren't into unwrapping the gifts as much as I thought that you would be. You would tear off a piece of wrapping paper, study it, want to stick it in your mouth. Then, you'd forget about the rest of the wrapping. I did most of the unwrapping for you, Katy, but once you saw the toy inside, you'd smile and get all excited and want to play with that one toy and not move onto the next gift. We ate like kings and queens Christmas Day. We had Holiday Strata for breakfast and turkey, potato stuffing (my first time going solo on the stuffing- good, but not as good as Grandma's! ), veggies, salad, ravioli, homemade meatballs and sauce, rolls, olives, cranberry sauce for dinner. We topped everything off with Red Velvet Cake and pumpkin pie ala mode. Yummy! It was a very nice, relaxing day spent inside, away from the cold. 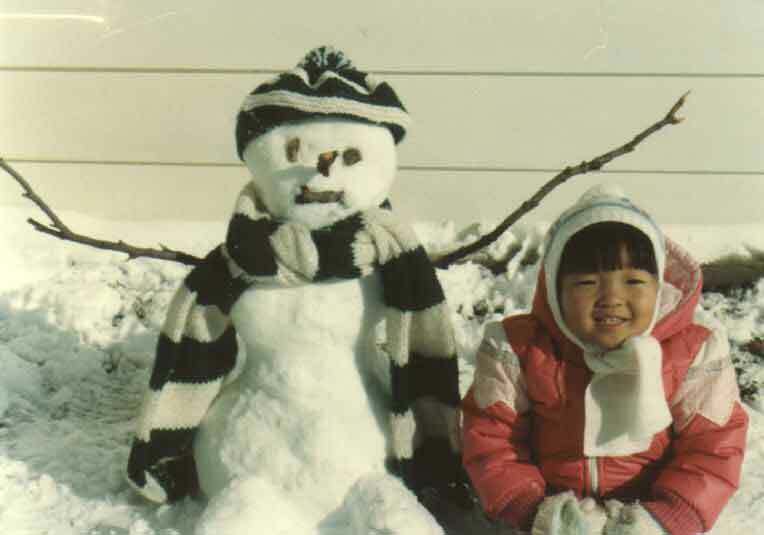 Speaking of cold, your very first Christmas was a White Christmas, Katy!! Snow didn't start falling till later in the day, but was still Christmas, so it still counts! "Hmm... I wonder who these cookies could be for...?" "The cookie is so close that I can almost taste it..."
"Yummy- what a tasty cookie!" "Santa... who? 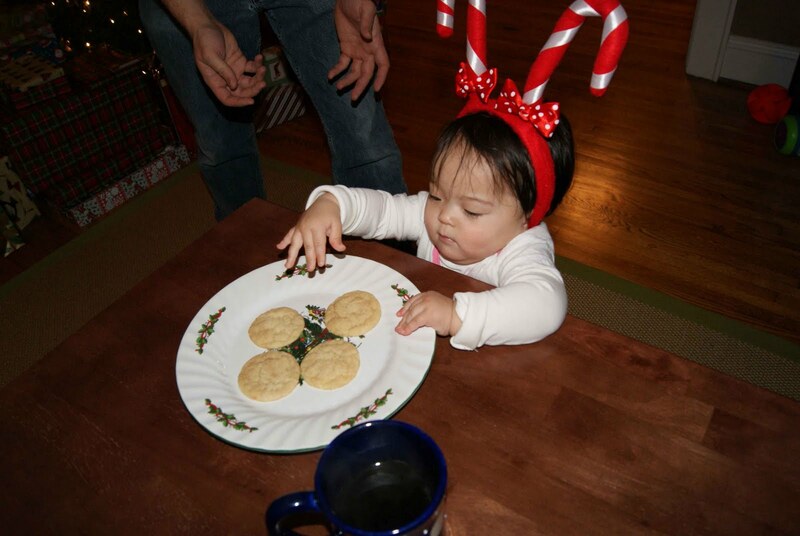 More cookies, please!" Santa specifically requested coffee and snickerdoodles from the Jones family, this year. 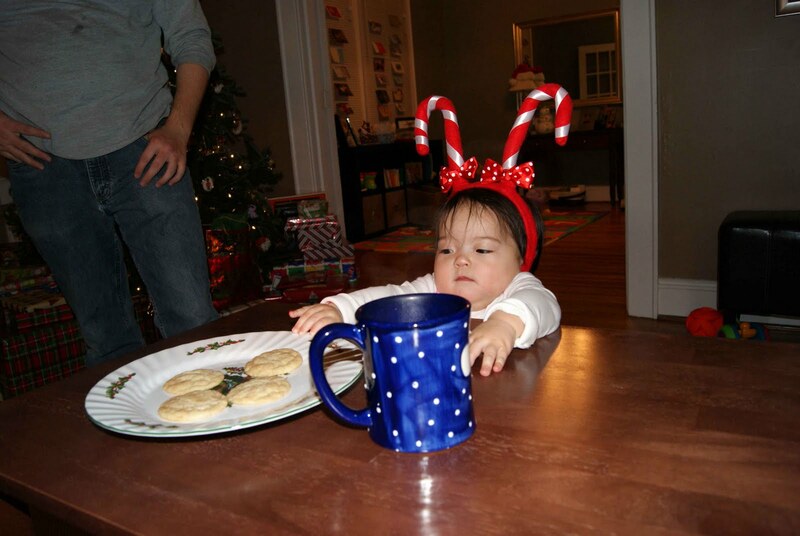 So, on Christmas Eve you "helped" put out a plate of cookies and a mug of coffee (one Splenda, please!) in anticipation of St. Nick. The cookies were oh, so tempting to you, Katy! 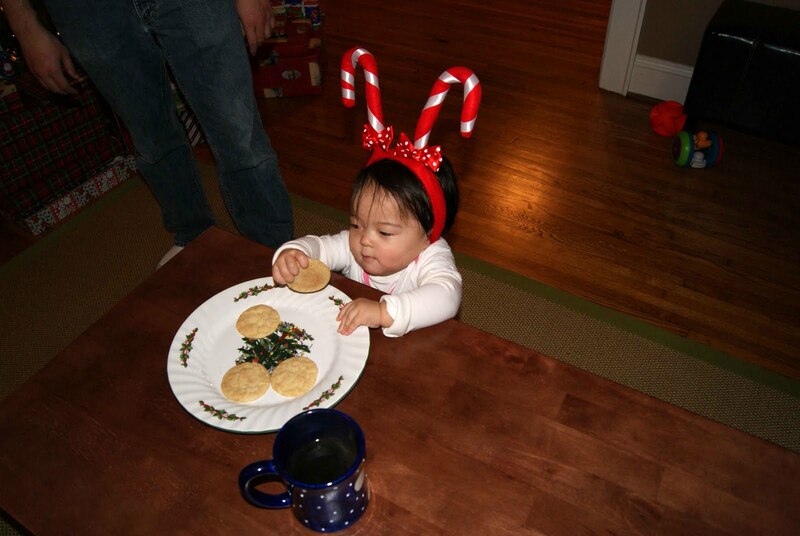 Suffice it to say that Santa didn't get all of the cookies that we had originally laid out for him! "Oooh, is this package for me?" Welcome home, Jared and Bethany! "Hmm... what shall I read, today?" 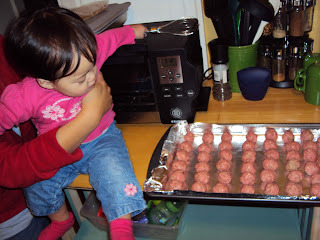 Cloudy with a chance of Meatballs- helping Mommy make meatballs for Christmas dinner! Like mother, like daughter- Katy's a purse girl! I think Katy's laughing at me in this picture! 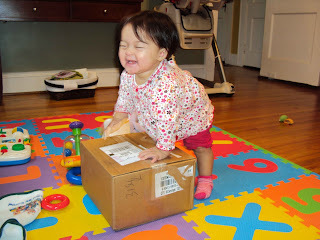 "I love getting Christmas packages!" 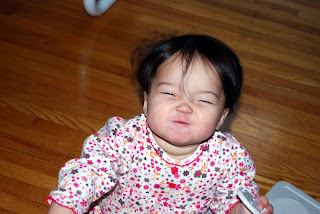 Love me that Scrunchie Face! Today you are 44 weeks old, Katy! 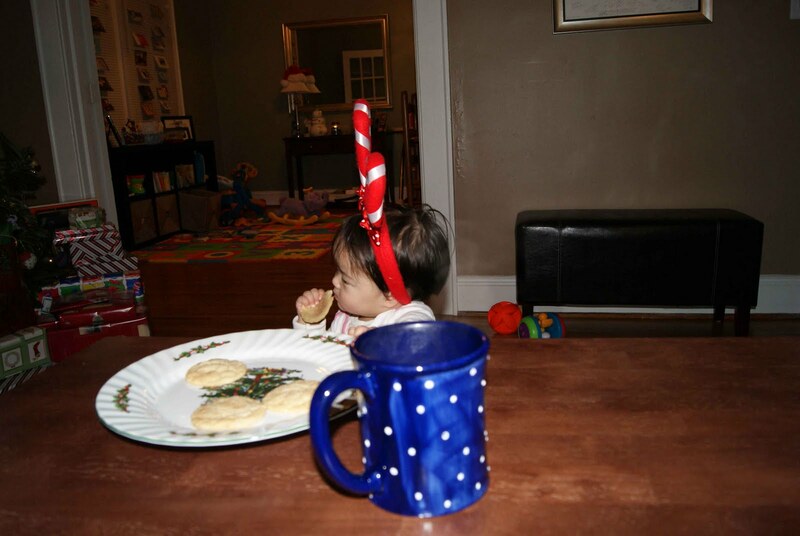 Merry Christmas Eve, Eve! Nana and Grandpa Jones are on their way down from N.J. to help us celebrate the holiday with Uncle Rob and Aunt Julie! This week, you ate very well. 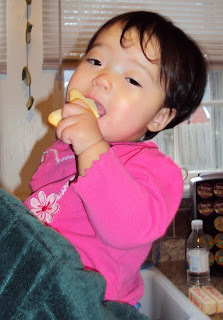 You were more adventurous in your eating- wanting whatever was on Mommy or Daddy's plate and wanting to feed yourself. For several lunches, you ate a quarter of a sandwich all by yourself. You are using your two bottom teeth more to bite off pieces of food and to chew your food rather than just open and swallow. This also means that we've found a couple of bite marks on various soft toys. Twice this week, you decided to be a night-owl and stay up very late (eleven o'clock!). You weren't necessarily unhappy, you just didn't want to go to bed! Sigh... I think you inherited my poor sleeping habits and insomnia. Last Friday, Daddy and I went to Daddy's company Christmas party at Howard and Michelle Hitchcock's house (This is the 8th Christmas party we've spent with them!). We dropped you off at our friends', the Smilies house while we went to the party. 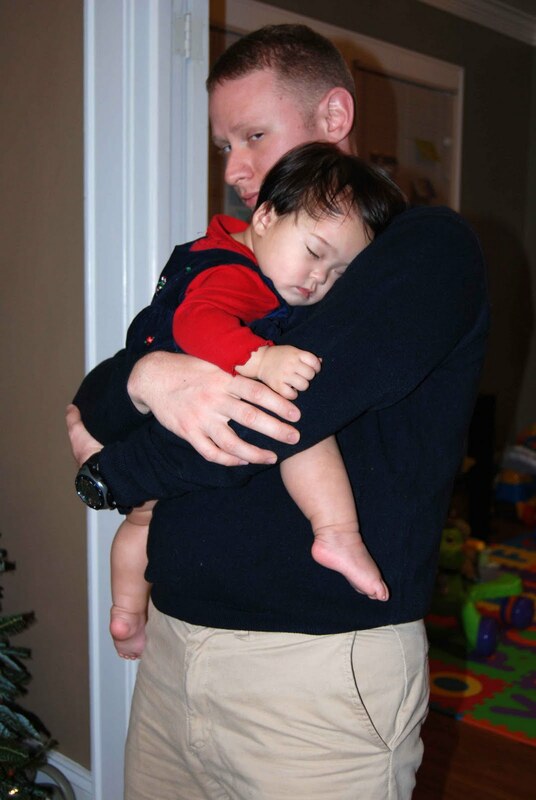 We are told that you played well with their son, Caleb, but once it came to bedtime for Caleb, you broke down. When we got to the door to pick you up at 9:30PM (three hours after we had dropped you off), things were a little frazzled. 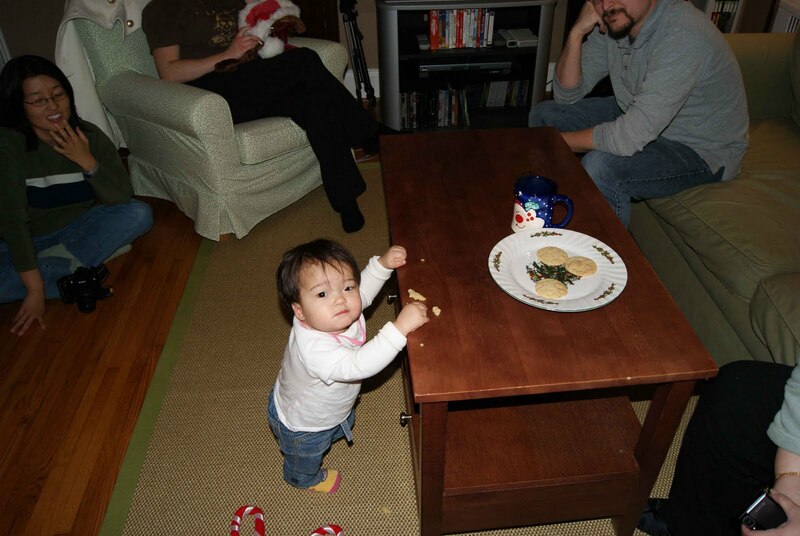 We've caught you standing up, in the middle of the room, unassisted. You will go from a sitting position to a standing position without using anything to get up. 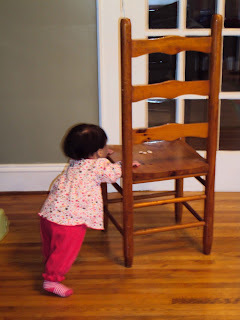 You continue to use boxes and chairs as a mode of transportation, pushing them around the room as walkers. You said, "Up," the other day when you wanted me to pick you up. While your vocabulary is limited to only five words, we know those wheels are turning in your head, Katy, and that you understand way more than you say. For example, you understand that small objects can go inside bigger ones. You realize that if you splash enough in the tub, the currents and motion will get the intended toy closer to you. 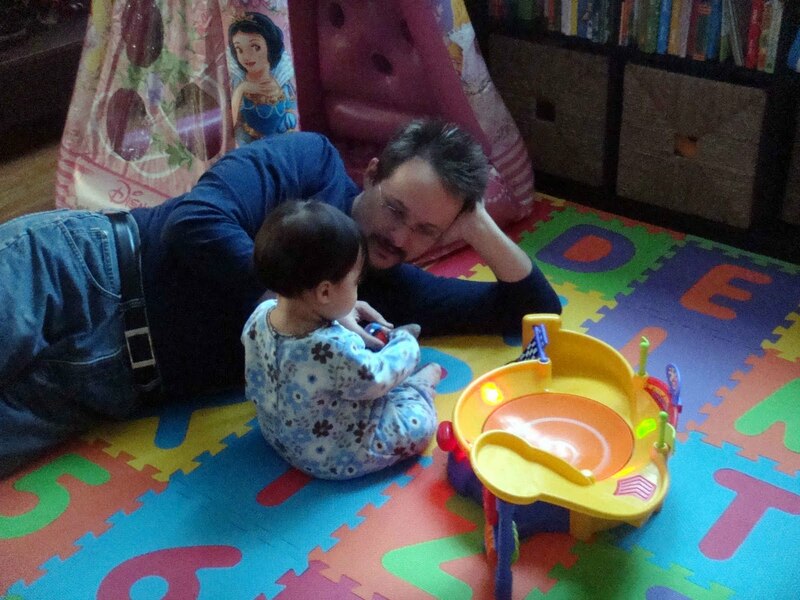 You know to specifically call Daddy, "Dada" and myself, "Mama." Of course, you still use the two words indiscriminately for arbitrary items, as well, but you do have a sense of recognition for both of us. 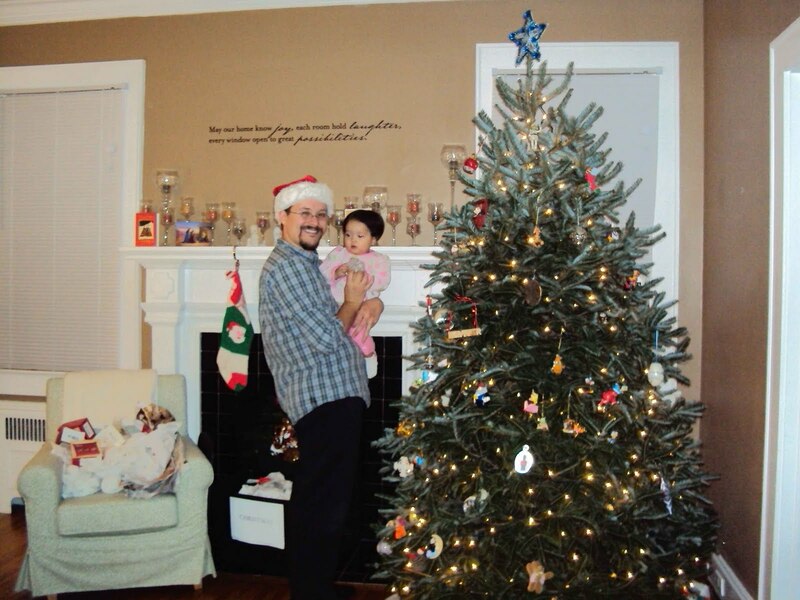 When crawling up to the Christmas tree, you always go looking for the teddy bear ornament, hanging on the lower branches of the tree that we let you play with. 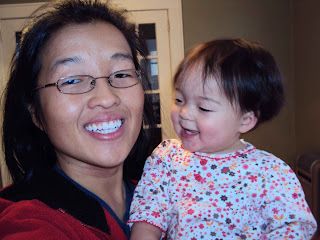 You love, love, love the sound of your voice and you are one of the most vocal babies I've ever known, Katy. We don't yet know exactly what you are saying but I'm sure it's interesting! You like to play "Peek-a-Boo" by opening and closing doors. You even shut me inside the bathroom one morning! You've also started patting us on the back when we hold you. It's almost like you are mimicking us when we pat you on the back and soothe you to try and put you to sleep. Speaking of mimicking, more than once Daddy and I have heard you trying to repeat what we say in inflection and tone- no words- but babbling that sounds an awful lot like a conversation or answer to our comments to you. 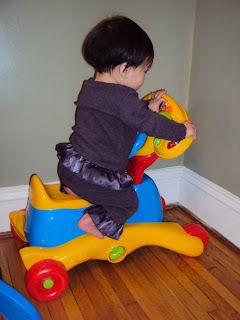 Also, you are consistently lifting your leg high enough to be able to get onto the seat of your bike all by yourself. You've also discovered that if you STAND on the bike seat, you are tall enough to reach the table under the dining room mirror. 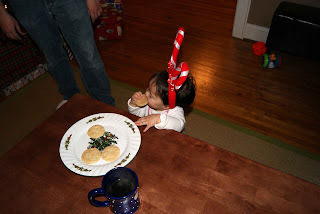 When we hand you your Cookie Monster hair brush, you like to put it up to your head as if you are "brushing" your hair. Sometimes it looks more like you are hitting the side of your head with the brush, rather than brushing your hair, but we believe that you at least understand the concept of brushing your hair. 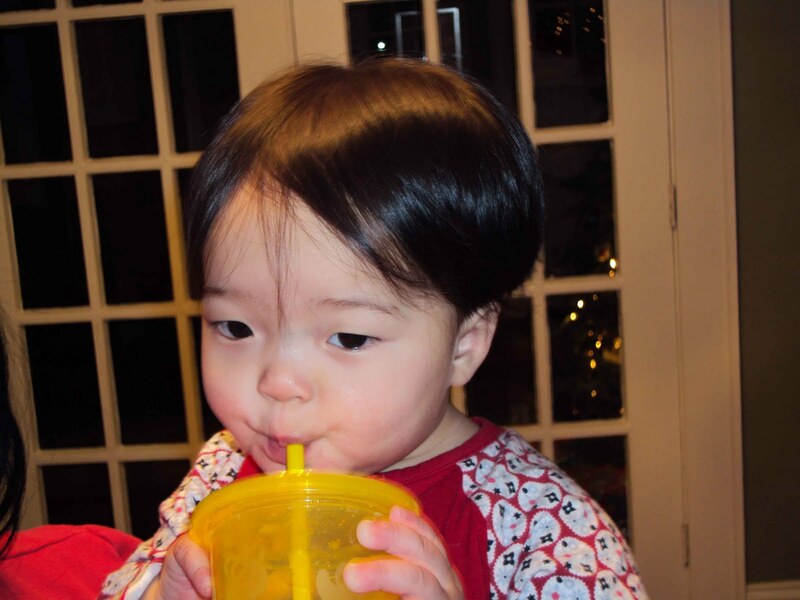 It's pretty cute- then again, we are very, very, very biased! Katy, this morning, while I was getting things done in the kitchen, you tugged on my pants leg, raised your arms and said, "Up!" Add one more word for the vocabulary! While eating lunch, today, you kept reaching for my pickle spear, Katy. So, I gave you a taste thinking that you wouldn't like it- that it would be too sour- and hoping tha would be the end of it. However, you proved me wrong when you started smacking your lips and pointing for more! Today, I got a phone call from my second grade teacher, Miss Corrigan. She was my teacher when I attended school at Sabold Elementary School. I still remember the song that she taught us so that we'd remember how to spell her name, "C-O-Double R-I-G-A-N, spells Corrigan..." She had received our Christmas card and called to say that you are, "scrumptious," Katy and I agree! Scrum-didili-umcious! “God Gave Us so Much” is a collection of three books, “God Gave Us the World”, “God Gave Us Love,” “God Gave Us Heaven,” following the inquisitive mind of Little Cub and her many questions about differences, different types of love and everlasting life. This playfully illustrated book delights children and adults alike with the side antics of Little Cub’s younger twin siblings, frolicking otters and dancing penguins. Little Cub and her family are illustrated in such a way that even an active baby will stay still long enough to laugh and point at the pictures. Images flow together seamlessly throughout the books and add to the feeling of cohesion throughout the three tome collection. From Mama in “God Gave Us the World,” Little Cub learns that the God created the world like a “mirror of (God’s) work,” It is diverse- black bears, panda bears and sloth bears- and that we need to take care of it. 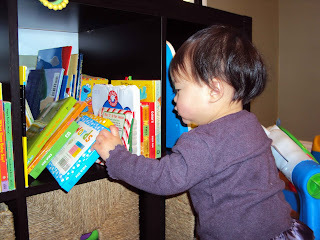 Little Cub’s LONG list of questions do tend to get wordy and repetitive causing little ones to lose interest. Also, the book does take a more universal religious slant when Papa states in “God Gave us Heaven,” “I think we’ll see all our loved ones there (in heaven)…” without any mention of sin, the fall of man or the harsh reality that not every person does go to heaven. This collection of books is a great way to introduce children to complicated, biblical concepts in a fun, simplified manner. By no means is this book meant to explain away every detail of the Bible- most adults wrestle with that! However, it is a great jumping off point to start a biblical dialog with children and the cheerfully sweet illustrations alone are enough to add this book to your child’s personal library. Within the last couple of days you have learned to point, Katy. 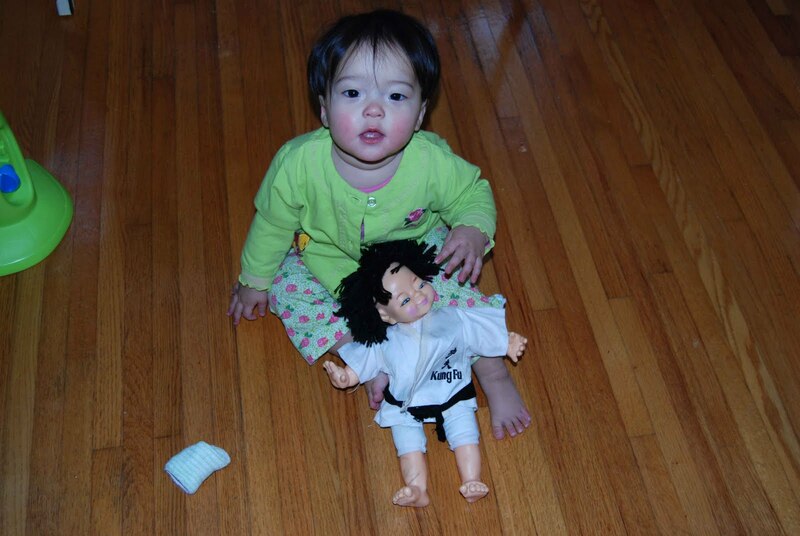 You will point to things that you want to play with, food, things that we don't want you to play with, etc. While you were playing in the dining room, you were crawling fast and furiously to the space heater. Daddy sternly called out, "No, Katy- Danger!" You stopped in your tracks, looked back at Daddy and pointed to the space heater. Daddy replied, "That's right, Katy- don't touch." You then proceeded to sulk and crawl away from the heater. 12/21/10- Update- Today, you pointed to my ice cream, Katy. You wanted some and I wasn't feeding it to you so you pointed your little finger so that I'd get the POINT! 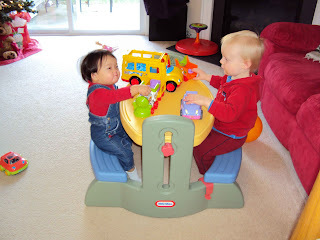 Katy and Caleb sharing and playing cars. Evelyn wanted to take pictures, too! Today was baking day at the Perkins! We joined four other ladies and their children for a day of baking, lunch, fun and fellowship. We accomplished toffee brownies, shortbread, Honey Chex mix and sugar cookies. 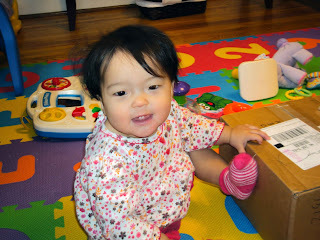 While I was baking, Katy, you were having a ball exploring a new place with LOTS of new toys!! Yummy and just in time for Christmas! 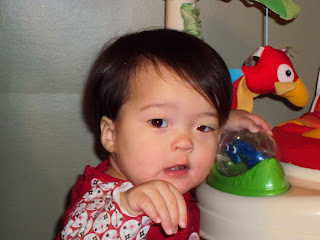 Today you are 43 weeks old, Katy! 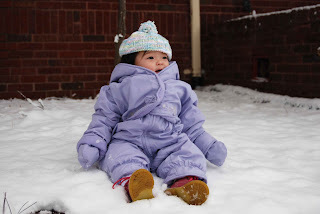 It was another chilly week with some *light* snow several times, so we mostly stayed indoors and tried to stay warm. We worked on getting the menu ready for Christmas. We also made some Lemon Bread and Snickerdoodles. Your Nana and Grandpa Jones and Uncle Rob and Aunt Julie will be here to share in your first Christmas, Katy! Christmas is a week away! This week, you broke out several times in hives all over your body- the first time was on your face (separate blog post) and the second time was all up and down the left side of your body. We have yet to determine exactly what is causing it but I suspect that it may be some Chinese take-out food that I ate (and is passed onto you through breast milk). If we sing the song, "If you're happy and you know it, Clap your hands!" you will clap your hands in all the right places. You can even anticipate when the clapping parts are coming. We also played a lot of "How big is Katy? SO BIG!" this week, too. Last year, Uncle Rob and Aunt Julie gave us an ornament kit for us to make an imprint of your hand for your very first Christmas, Katy. 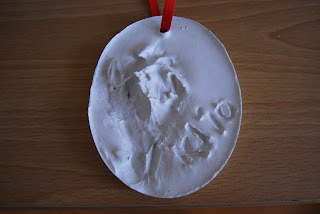 Whatever visions of a perfect ornament for our perfect Christmas tree went right out the window when you dove for the plaster mold with your hands and decided to squish it all over. We tried the foot, we tried both hands... no (legible) hand print to be had, but certainly a lot of laughs! I know Daddy and I will look back at this ornament in the years to come and laugh at what a hard time we had getting a finished product! This afternoon, as I was nursing you, Katy, and you had *almost* fallen asleep for your nap, the left side of your face broke out into hives! The hives started joining to form plaques and the area was red and warm to the touch. The hives got awfully close to your left eye making it slightly swollen. Needless to say, this scared me and I woke you up immediately (you know it must have been bad if I'm waking you up from a nap- no mother willingly wakes her child from a nap!). I applied some hydro cortisone and called the doctor. After talking to the nurse and running out to get some Children's Benadryl (why did I not have any on hand?! ), I don't know what caused the allergic reaction. 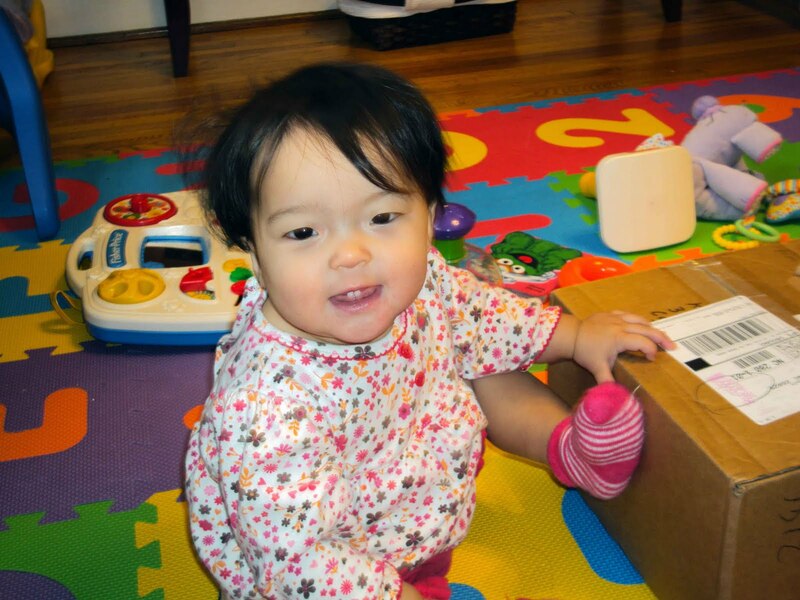 The hives were gone by the time Daddy came home from work and you were your usual happy, smiley self. Could it be the pears and blueberries I fed you for breakfast? Could it be the detergent used on your winter coat? 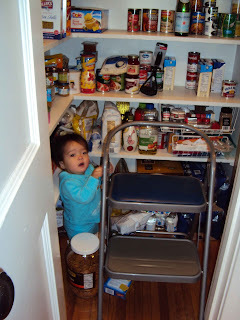 Something in the air when we went grocery shopping, this morning? The sugar cookie you ate while at Harris Teeter...? 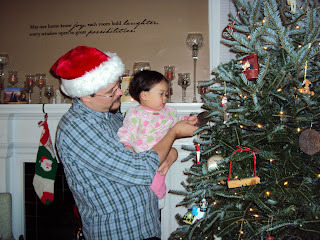 Katy helping Daddy hang her first ornament of the season. "Sisters, Sisters... there were never such devoted sisters..."
Tonight we decorated the Christmas tree, Katy. 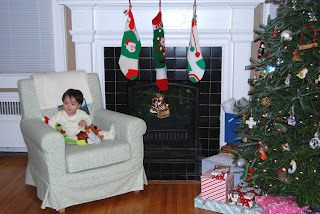 We sat you in your exersaucer while Daddy strung lights and I unwrapped ornaments for the tree. All the while, we had White Christmas playing in the background in true Tinkey tradition. I think we even saw you roll your eyes when Daddy and I started quoting the movie word for word. 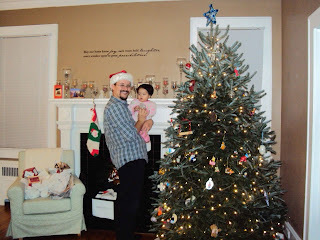 It's amazing how quickly the tree decorating process goes when you've got a little one with a short attention span! The Jones family is officially ready for Christmas! !